In order to further our mission to make space accessible to everyone, we are constructing an optical beacon to be visible from Earth. In order to accomplish this goal we will be using a high-power LED panel pulsed in triplets (Interrupted Quick Light Pattern). We plan to flash this array of 4 LEDs 3 times in succession every minute, which will allow between 9 and 18 sighting opportunities per orbital pass over the sighting location. The panel is designed to produce a flash intensity with an apparent magnitude of 3, the same as that of the North Star. In this way we will provide sighting opportunities to enthusiasts around the world without the need for telescopes or even wide-field binoculars. Ensuring that EquiSat’s optical beacon is visible from Earth requires a great deal of power. In order to conserve power, we will not flash during every eclipse, but rather, once per “cycle”. In our case, one “cycle” is defined as two orbital periods in which flashing only occurs during the eclipse of the second period. This allows enough energy to be collected and stored in the batteries in order to meet visibility requirements. 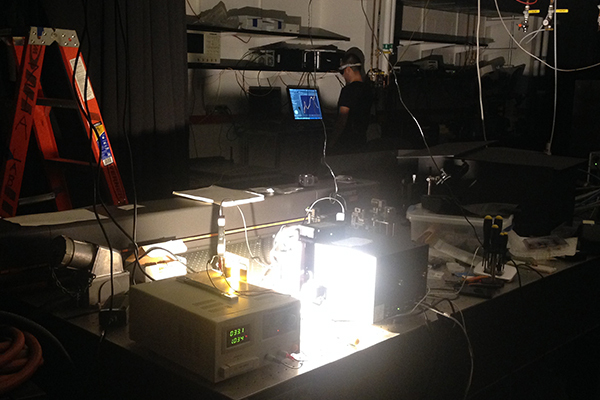 To accurately characterize our LEDs, the flash team is working with Brown University’s photonics lab. The lab, headed by Professor Rashid Zia, contains high-quality equipment and years of expertise working with LEDs. The goal of our testing is to measure the spectral output and power emissions from our LEDs, which can then be used with models of human brightness perception and Lambertian surface emission to determine brightness. As with any system intended to fly in space, one of the primary concerns with our optical beacon’s design and construction is thermal management. The CXM-27 LEDs’ temperature must be kept under 140 C or else they will begin to degrade. In the vacuum of space, heat cannot be carried away by convection, it must be conducted away or radiated outwards. Additionally, the LEDs are located very close to the LED driver electronics which also generate a lot of heat. To deal with all of this heat, the area between the two boards will be filled with thermally conductive material to dissipate the heat to our chassis. The LEDs’ integration with other systems, such as the radio, is also paramount to the success of EQUiSat. In order to maximize the number of solar panels available on the satellite power generation, the radio antenna must be on the same side of the cube as the LED array. It must be able to be deployed without the risk of catching on any of the LEDs. As such, a special, raised deployment system is being constructed to fit on the panel with the LEDs. Originally, EQUiSat planned to use a xenon flash tube (XFT) often used in photographic strobes as the light source for an optical beacon. We have since transitioned to an LED array. LEDs are considerably more durable than an XFT making them much more likely to survive the launch environment. Additionally, the LEDs will not require the large aluminum reflector necessary for the XFT to reach desired brightness and maintain structural support of the glass bulb. This will significantly reduce the mass of the payload and increase feasibility of meeting CoG specifications. The resulting circuit will no longer require the use of a flyback transformer for Xenon gas ionization. This greatly simplifies and increases the reliability of the payload’s circuitry. Finally, LEDs also offer a much more predictable flash in both duration and magnitude, making them much easier to manipulate and therefore easier to test. Increased testing reliability will result in greater confidence in sighting opportunities and predicted brightness. The original LED array would have consisted of between 9 and 15 Luminus SST-90s. These LEDs met all of our goals and additionally they had the advantage of redundancy; if one or more failed it would not greatly diminish the brightness of our satellite. However, in order to reduce electronic complexity, we decided to wire them 3S3-5P, meaning that if one fails, you lose the entire row. Additionally, testing determined that we did not have enough room for the number of LEDs that it would take to accomplish our brightness goals. We briefly considered using reflectors again, however the manufacturing complexity of adding all of those reflectors made it time to choose a different LEDs. To minimize the total number of LEDs and complexity in our circuitry, we switched to Luminus CXM-27s. These LEDs were much simpler to work with for both manufacturing and electronics. 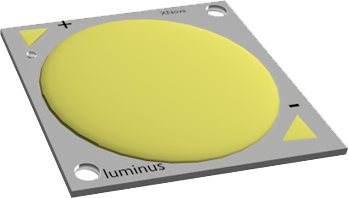 Not long after we selected these LEDs, Luminus released the CHM-27, which provides a more luminous output for the same power requirements and package.